You are here:Home » Get the eBook! You may be a tourist, living abroad for the long-term, journalist, missionary, or someone who travels abroad for business. You may even be a student, or the parent of a student, or a missionary about to travel overseas for the first time. In all cases, this book provides you with an overview of some techniques you can use to recognize and assess risk, develop preventive measures, or react smartly when confronted with a problem. Speed, ease, and access for world travelers are the best they’ve ever been…but most tourism guides don’t address the real need for personal security. 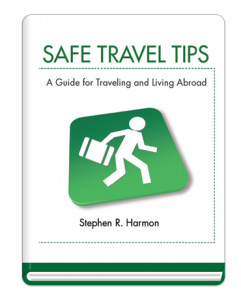 This planning guide closes the information gap by describing some simple and practical methods to help you plan so you can enjoy your travels with confidence and return home safe. It’s written by an intelligence community professional that traveled for more than twenty-two years throughout Europe, Asia, the Middle East, Sub-Saharan Africa, and Central America. It contains best practices from both personal experiences and professional training courses. It’s meant to be deliberately simple and easy to apply to your particular circumstances. So… read, plan, prepare and go! You won’t regret it. And remember… no one takes better care of you than you do.